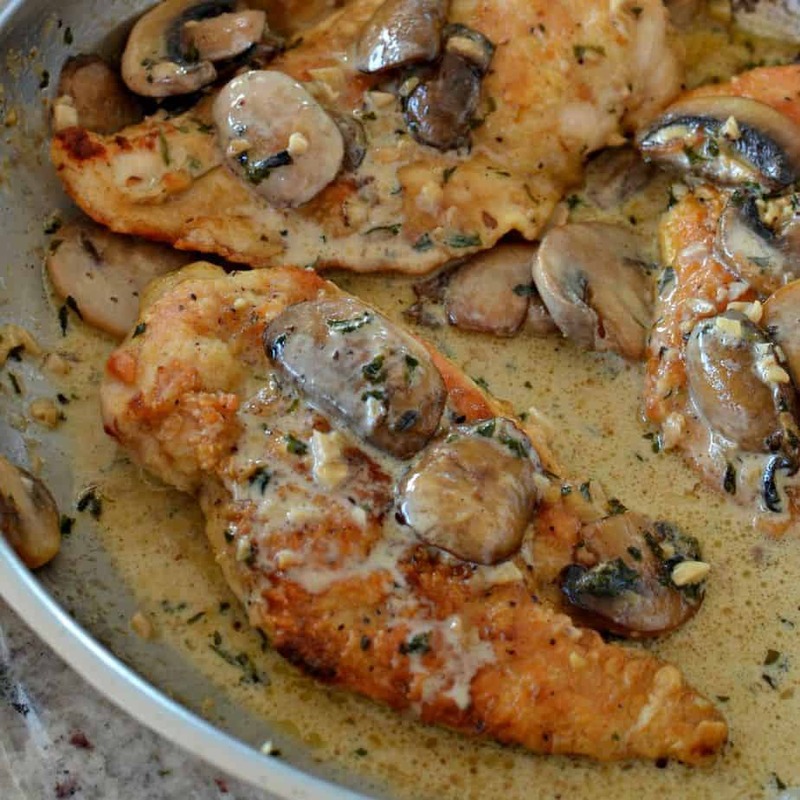 Easy Garlic Chicken combines lightly breaded chicken with golden brown mushrooms and garlic yielding a delectable quick comfort dinner. Easy enough to make during the week yet fancy enough for company. For an extra tasty meal pair with Cheesy Scalloped Potatoes and Oven Roasted Garlic and Parmesan Asparagus. Do you like garlic? Our family simply loves it. I think my husband is the biggest garlic fan ever. You will love this simple yet extraordinarily delicious recipe. It takes no time at all to put this Garlic Chicken together. Perfect for that weeknight quick meal or Saturday night dinner party with friends and family. How do you make Garlic Chicken? Start by cutting two large chicken breasts in half lengthwise. Combine flour, pepper and salt in a shallow plate. Dredge chicken breasts in the flour mixture. Heat oil in skillet over medium heat. Cook the chicken breasts until golden brown on both sides. Remove to plate and place in oven on warm uncovered. Now melt the butter and add a little more oil over medium high heat. Add the mushrooms and cook until they are golden brown stirring frequently. Reduce heat to medium low. Add the garlic and the parsley cooking for one minute. Pour in the chicken broth and the heavy cream. Simmer for about ten minutes. Bring the chicken back to the pan and simmer until warm about five minutes. Can you use chicken thighs for Garlic Chicken? Yes you most certainly can. In fact I prefer chicken thighs but I am the only one in my family that does. I find dark meat tastier and less apt to dry out than white meat. Do not cut the thighs in half as the directions read for the chicken breasts. Thighs are quite a bit smaller so I would count on two per person or a total of eight for this recipe. Chicken thighs are also more economical and you get a little more bang for your buck! Can you add more garlic or whole garlic to Garlic Chicken? Calling all garlic lovers. You can add more minced garlic, or garlic cloves or even crushed garlic. Just keep in mind your families and your personal preference for garlic and add accordingly. My husband would love it if I added a whole bulbs worth of cloves but the kids would not like that much. 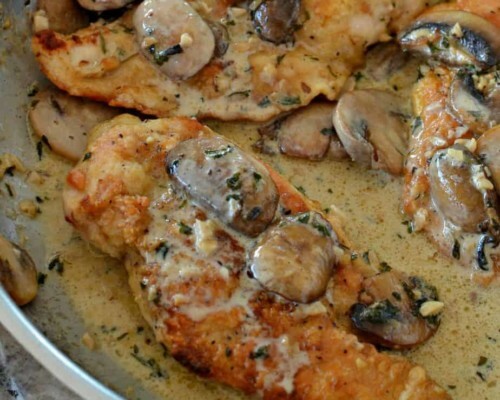 Helpful hints on making this Garlic Chicken totally awesome! Use vegetable or canola oil for browning the chicken. These oils have a high smoking point and the chicken will get more of a crispy crust. Do not cover the chicken when placing in the oven on warm. Covering it causes condensation and that will start to break down your delicious crispy crust. Cook your mushrooms over medium high so their moisture will cook off and they will brown well. 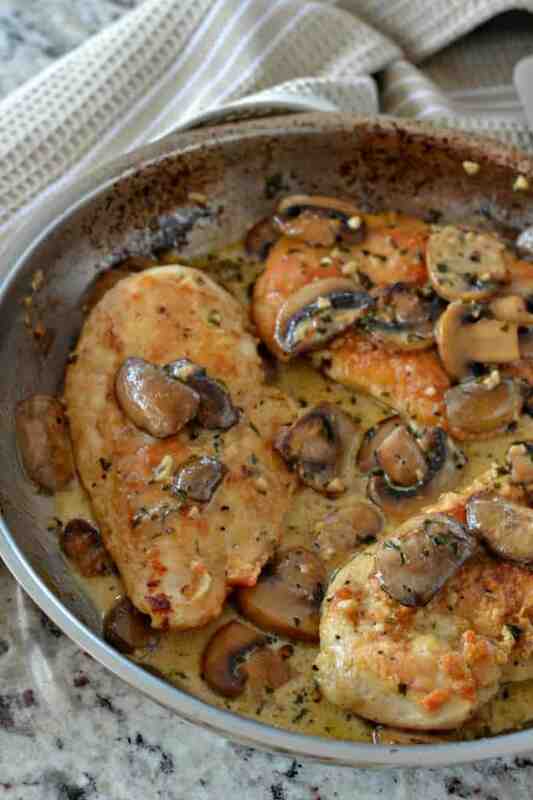 Toss in the garlic when the mushrooms are almost completely cooked and don’t forget to reduce the heat and stir. Garlic cooks and becomes fragrant in less than one minute. If cooked too long it becomes bitter. This dish is best served immediately so have your sides ready to go. Garlic Chicken is easy, dependable, quick and so delicious making it the perfect weeknight family meal. You may even have the ingredients in your kitchen already. If not get your shopping list going and make your family an awesome meal. 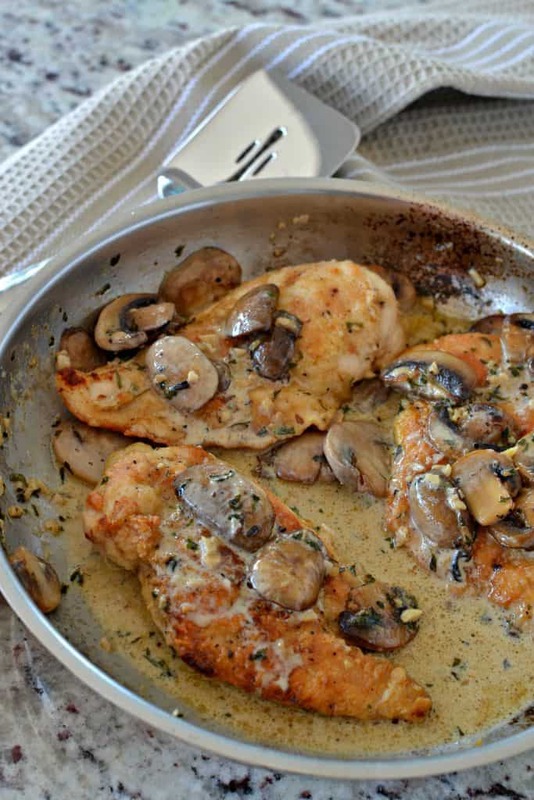 What do you serve with Garlic Chicken? Other chicken recipes you will love! This post was originally published August 29, 2014 and was republished January 28, 2019 with new content. 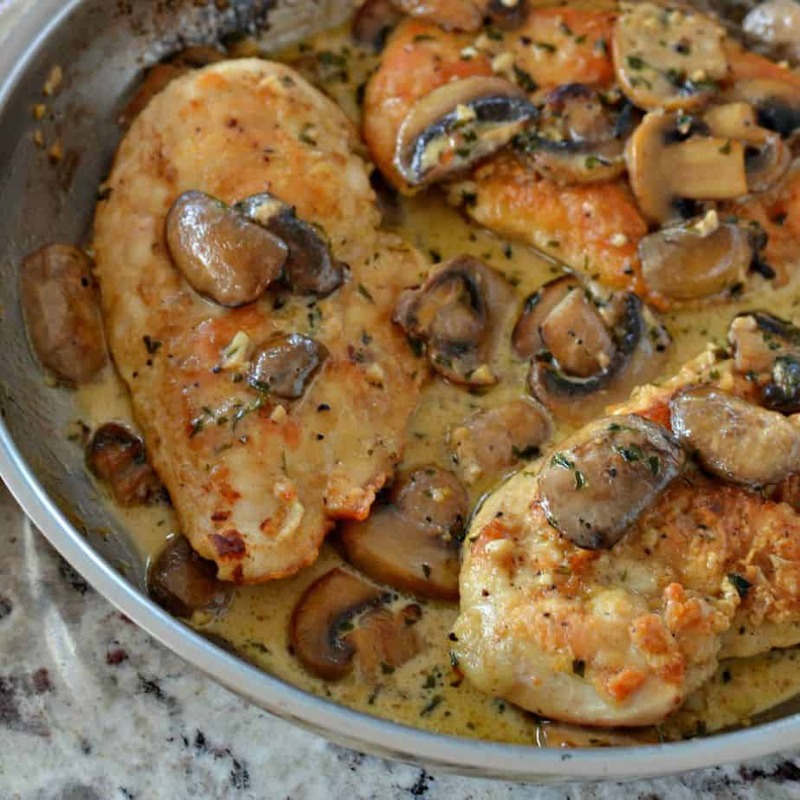 Easy Garlic Chicken combines lightly breaded chicken with golden brown mushrooms, garlic yielding a delectable quick comfort dinner. Combine flour, pepper and salt in a shallow plate. Dredge chicken breasts in the flour mixture. Heat 1 tablespoon vegetable oil in skillet over medium heat. Cook the chicken breasts until golden brown on both sides. Remove to plate. Place in oven on warm uncovered. Add 1 tablespoon butter and 1 tablespoon oil over medium high heat. Add the mushrooms and cook until they are golden brown stirring frequently; approximately 8 minutes. Reduce heat to medium low. Add the garlic and the parsley. Cook for 1 minute; stirring frequently. Pour in the chicken broth and the heavy cream; simmer for 10 minutes Bring the chicken back to the pan and simmer until warm about 5 minutes. Don’t cover the chicken to keep it warm. I place it in my oven on warm uncovered. Covering it causes steam and that breaks down the flour coating. Delicious, made with chicken thighs. So good! Need to cook a bit longer, of course. I wish there was a bit more sauce though. I will definitely make again. Why is dried parsley listed twice? I didn’t use the last 1 tablespoon. So glad that you liked it. Thanks for the heads up. It was an error. I omitted it. We have a new puppy here and the distractions are numerous!